Has technology lived up to its promise? In the “Tomorrowland” quadrant of Magic Kingdom at Walt Disney World in Orlando, Florida, there is a curious attraction called “The Carousel of Progress.” The ride is a circular moving theater that takes audiences to five different stages where animatronic people sit in living rooms at various decades of the twentieth and twenty-first centuries. It’s very entertaining and humorous, and the robots’ movements are quite uncanny. There is also a catchy song that you probably started singing after you read the title if you’ve been on the ride. Lighthearted family fun aside, the ride highlights a disparity between the future in our entertainment and the future in real life. In the show, the animatronic father frequently announces that things are looking really modern and futuristic and that this is probably the highest technology will go. But does anyone say that in the real world? In my experience, the answer is quite the opposite. People are amazed at this invention or that innovation but I don’t know of anyone who would say we’re living “in the future.” I certainly don’t feel like we’re living in the future. I mean, yeah, my phone can video chat with anyone around the world for free and scientists can perform face transplants, but we still cook food on the stove instead of “Hydrate Level 4”, we have to rake our leaves every fall, people still get colds and fevers, and we’re only just now seriously talking about Mars exploration. We have some pretty spiffy gadgets and gizmos but a lot of life remains the same. Personally, I don’t find that a bad thing. The older I get, the less impressed I am with high-tech wizardry and the less enamored I am with neon-illuminated mega-cities. Of course, I am grateful for the technological marvels that surround us and especially for the advances in science and medicine, but it’s also easy to romanticize the “good ol’ days” when life was simple and everyone lived in Mayberry. The whole purpose of new inventions and innovation is to make our lives better. Has technology lived up to its promise? 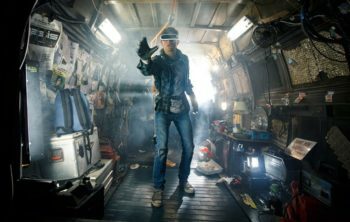 Ready Player One, the new movie based on Ernest Cline’s bestseller, comes out next week, and it depicts a world where people have essentially given up on real life to spend as much time as possible in the OASIS, a virtual world where anything is possible. As our society has progressed past the Age of Machines and we are now in the Digital Age, the next technological era seems to be the melding of mind and machine and virtually fulfilling our impractical fantasies (realistic VR is an exploding frontier). It’s a silly conundrum when you think about it. Stuff hasn’t made the human race happy, so the obvious answer must be better stuff. And when we reach the limit on what better stuff we can physically make, we’ll make virtual stuff! Surely the answer is just over the next hill of innovation. Ever notice how quickly the “I got the latest gadget!” euphoria fades? It’s all empty calories but don’t worry – your next high-tech snack is just one expo away. It’s easy to quote back-to-nature philosophers like Thoreau or the Unabomber but that isn’t the answer, either. The human race wasn’t put on this planet to chase gold and jewels, nor iPhones and Instagram likes. Technology has made our lives better in many ways, but unlike animals, creature comforts are not enough to sustain us, because we a soul that yearns for communion with the Creator, and that’s something no VR experience could ever replicate. Great article Mark. I’ve nothing really to add since you said it so well! I agree. I’ve been writing a dystopian series set in the near future addressing this. There’s a tendency to view any advance as progress, though we rarely seem to count the costs associated. But to caution against these advances leaves you feeling a bit like Ian Malcolm warning Mr. Hammond that a park full of live dinosaurs might not be so great.